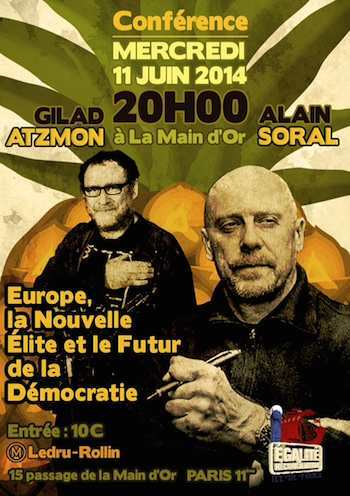 Alimuddin Usmani: Despite its portrayal as racist and anti-Semitic by some French politicians and the mainstream media your Lyon conference with Alain Soral on May 26th was a huge success. Six hundred peaceful people attended the event. Tell us something about your impressions of this gathering. Gilad Atzmon: Most of all, I was overwhelmed by the demography in the room. As I mentioned that evening, I have never witnessed such a diverse crowd. I guess that 30% of the people in the room were immigrants who see Soral and Egalitarian Reconciliation as the path to true Frenchness. So while the Left talks about ‘diversity’ and ‘tolerance,’ in spite of being predominantly white and totally detached from the lower classes. In the real world, it is Soral who is able to translate diversity into a popular awareness on both social and political level. This leads me to reflect again on the distinction between dwelling and settlement. To dwell is to love your soil, to adore the sky above it and to cherish your culture with patriotic zeal. To settle, on the other hand, is to occupy a space, to consume, to take, but never to give back. The people whom we met at the conference were clearly dwellers. Many of them are immigrants, yet they are French patriots. The notion of a settler is descriptive of the Jewish wandering attitude. It explains why the Jewish State is an ecological disaster, why its rivers are poisonous, and it also explains why Diaspora Jews are so often attached to the Zionist dream and the ‘promised land’ instead of loving their neighbors wherever they are. Were the Zionist Jews dwelling in France, Britain or USA, they wouldn’t need the dream of returning to a phantasmic promised land. Were the Jewish anti Zionists dwellers (as opposed to settlers), they would fight Zion within a universal campaign instead of from Jews-only political cells that are as racially exclusive as the Jewish State. I was truly inspired by Alain Soral, by his undeniable charisma, but also by his political message and superb analysis. It is rare to have the capacity to engage in a proper and lengthy intellectual exchange with a large crowd. Soral and I are progressing in parallel modes, we reach the same conclusions through totally different approaches. Very interesting indeed. Gilad Atzmon: To start, let me say it was one the most exciting nights in my entire career. The place is a shrine to goodness and humanity. The positive and sincere vibration is something you detect as you enter the building, it is all-encompassing. Dieudonné himself is a force of nature. I am not surprised that the Jewish ethnic campaigners and their subservient ‘Socialist’ Government are tormented by this man – he is genuine – he is bonded with existence and connected with the people. Dieudonné possesses all of the Athenian qualities the Jerusalemites lack. He is not just Christ, he embodies the meaning of Christ, by means of laughter he transcends himself far beyond his plight. By the way, I believe that the most interesting aspect of the parallels between Dieudonné and Christ is the similarity in ‘Christ killers,’ those who are united against goodness, truth and against universal and human brotherhood. The term ‘Christ killers’ also refers to the tactics employed in the crucifixion, the role of the Sabbos Goy, the Pontius Pilates of our time, who kill on behalf of others. Alimuddin Usmani: The Haavara Agreement between the Zionist Federation of Germany, the Anglo-Palestine Bank (Leumi Bank today) and the economic authorities of Nazi Germany which facilitated emigration of German Jews to Palestine is not generally known by the wider public. Is this agreement something Israel and Hasbara are embarrassed about? Gilad Atzmon: No doubt. The Haavara Agreement points to a high level of collaboration between Nazi Germany and Zionist institutions. It also supports the argument that Nazis, at least ideologically and at that particular time, were seeking peaceful methods to rid the Germanic land of Jews. The agreement also shows that even at that early stage, Zionist institutions kept 25% of the wealth of German and Austrian Jews and were driven by greed. Already in the 1930’s, Zionism was a pragmatic Judeo-centric system specializing in the translation of Jewish pain into cash. Alimuddin Usmani: In the conference we learned about the process of "perfection of the race," which had been practiced for about 1500 years within the European Jewish ghettos. You explained that problems encountered by the Palestinians are partially the result of the emigration of this Jewish cognitive elite to Palestine, especially the wave of German Jews who landed on Palestine’s shore following the Haavara Agreement. Would the situation in Palestine be different without this agreement? Gilad Atzmon: Hard to say. Allow me to elaborate. In the beginning of the 20th century it was pretty much accepted that German Jewry were the leading cognitive elite within European Jewry. However, this community was largely patriotic and devoted to the German national ethos. Until 1933, German Jews lived in extremely comfortable conditions and felt totally integrated and secure. Zionist influence was only marginal amongst German Jewry. Bearing that in mind, The Zionist movement was extremely clever in bringing a large portion of that German Jewish cognitive elite to Palestine. However, it is very important to point out that the German Jews rarely participated in Zionist politics or militarism. Instead they founded Hebrew University, scientific institutes, contributed to culture and arts, formed philharmonic orchestras, and, in time, they became the pillars of Israel’s cognitive elite. But they also contributed to the emergence of Israeli dissent. Uri Avneri, for instance, is a member of that unique sub culture within the Zionist school of thought. I am not sure that we can directly associate this class of German intelligencia with the Nakba or the expulsion of the Palestinians. It was clearly the Russian and Polish Zionists who executed that vile program. In fact, the German Jewish intellectuals, such as Buber and Sholem, were the first to oppose Zionist militarism and extremism. Alimuddin Usmani: Cicad (the Swiss Jewish lobby) is very assertive in its condemnation of Dieudonné. They know about your work but you’ll never hear them speak in public about Gilad Atzmon. Is it because they understand that talking about you exposes the matrix of power in which they operate? Gilad Atzmon: That is possible. They left the task of condemning and harassing me to an American Jew named Gabriel Ash who runs the BDS campaign in Switzerland. The tribal operation is extremely well coordinated, with each segment of the tribe contributing to the strength of the chosen. Ash, Max Blumenthal, Democracy Now and even Chomsky are there to gatekeep the so called Left and to deny entry to those who are brave enough to point to Jewish power and criticize it. They effectively made Palestinian solidarity and the Left into a controlled opposition front. But here is the paradox -by the time they almost succeeded, they were devastated to discover that they were left with a synagogue. Both the Palestine Solidarity movement and the Left are now isolated tiny and dethatched bodies with zero political relevance and limited support base. And this is indeed tragic because the suffering of the Palestinians is more acute than ever. Alimuddin Usmani: On 24th of May, three people were killed in a shooting inside the Jewish Museum in Brussels. Authorities and the press were quick to blame a random antisemitic attack. A few days later Israeli media outlets identified links between two of the Israeli victims and the Mossad. What do make of this? Gilad Atzmon: Obviously I am not in a position to know what actually occurred. The video that was released by the Belgian police doesn’t look like a ‘hate crime.’ It appears to be a professional job, but I really lack the information to evaluate the mater with any certainty. What I can do is analyze the meaning of events and the way in which they are reported and make an impact. I am more interested in the philosophical and ideological meaning of Jewish fear than the circumstances that lead to the creation of so much anxiety. Alimuddin Usmani: In 2011 a picture was published on the internet showing a puppet wearing an Israeli flag and a kippa (skullcap) being hit in the head by an arrow. Two young people were charged with racial discrimination by the authorities and accused of inciting the murder of Jews. Both claim that the picture was just a way of criticising Israel’s policies. The trial is still ongoing since the youngsters have appealed the verdict. What would you like to say to these two young rebels? Gilad Atzmon: The fact that some or even most Jews cannot cope with a comic attempt to criticize Jewish politics and power suggests that they feel shame and for the obvious reason. But I do not believe that this is the case here. Jewishness is a power exercise. It is a constant attempt to figure out the boundaries of Jewish dominance by challenging negation. They push and push until eventually they face negation in the form of a pogrom. That is when the Goy says ‘enough is enough.’ By then the Jew is reduced to victimhood and the cycle begins again. I wish that the cartoonists could confront the authorities by explaining that humour is not just a message, it is actually THE message. The attempt to interfere with humour and censor it is a crime against humanity and the human spirit.